Dolly Parton’s Imagination Library – A year ago, I briefly mentioned Dolly Parton’s Imagination Library but tonight I want to outright promote it. The program is probably the greatest thing ever. You sign up your baby online and from that point until she turns 5, a book will arrive in the mailbox every month. It is 100% free. The books that you will receive are all age appropriate and are a mix of classic children’s books and more modern selections. Sloan’s little personal library is rapidly growing but her Imagination Library books are some of the ones we read to her over and over. If your state is part of the program (South Carolina is), I highly recommend signing up your child. 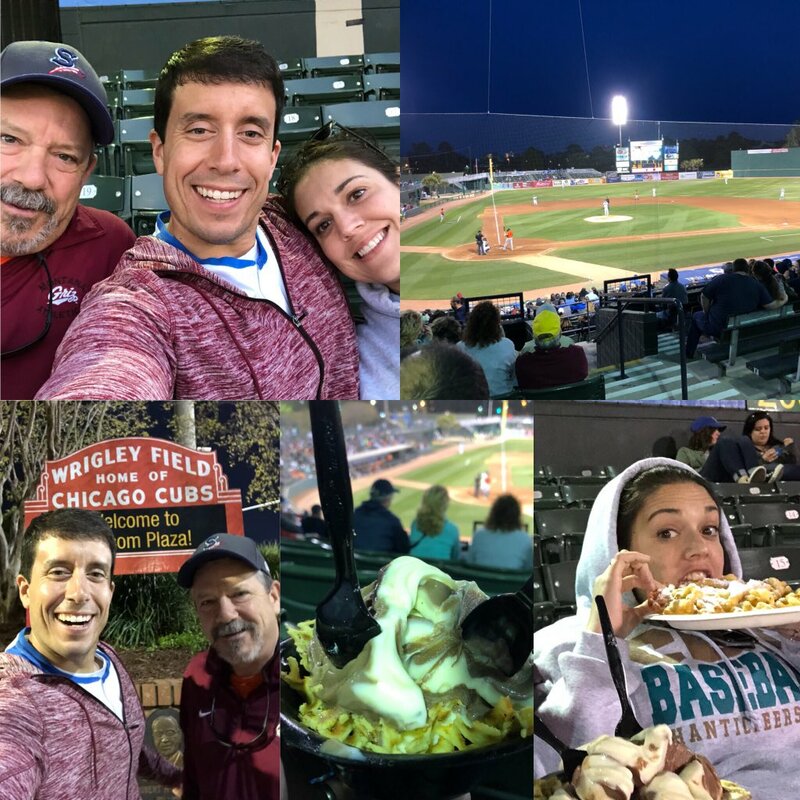 Paducah, Kentucky – Late April is the time of the year when I reminisce about the cross country trip I took with my dad when I moved to Myrtle Beach. Four years ago on this date we inched close to what would become my new home, calling it a day and parking the U-Haul in a place called Paducah, Kentucky. 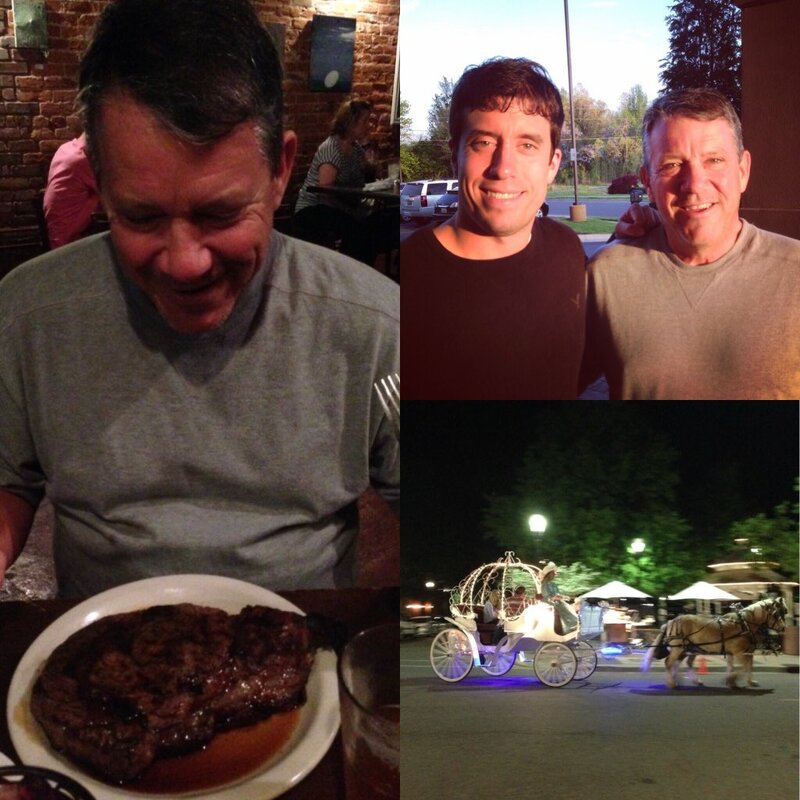 We spent the evening relaxing in Paducah’s downtown area eating steaks and admiring the atmosphere. After our food settled, we were ready to head back to our hotel as the 600+ miles we had traveled that day started to catch up with us. As we waited for a cab, we watched a horse-drawn carriage trot by. A few photos from our short stay in Paducah, Kentucky. Thanks For The…Umm…Compliment? 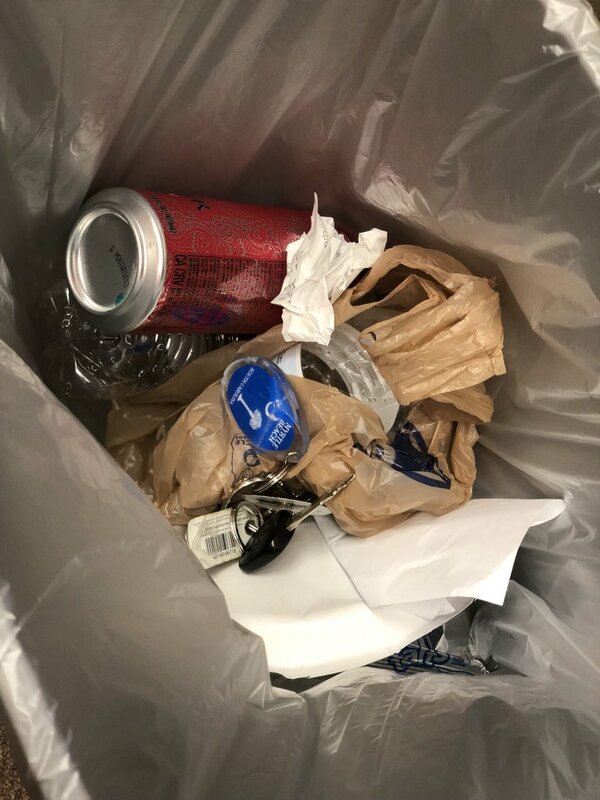 – Our social media program has received a lot of recognition over the past four years but I don’t know how to take the latest “honor.” This week, a web estate auditing company called eQAfy released findings on the data it collected on the social media programs of all universities in the country. 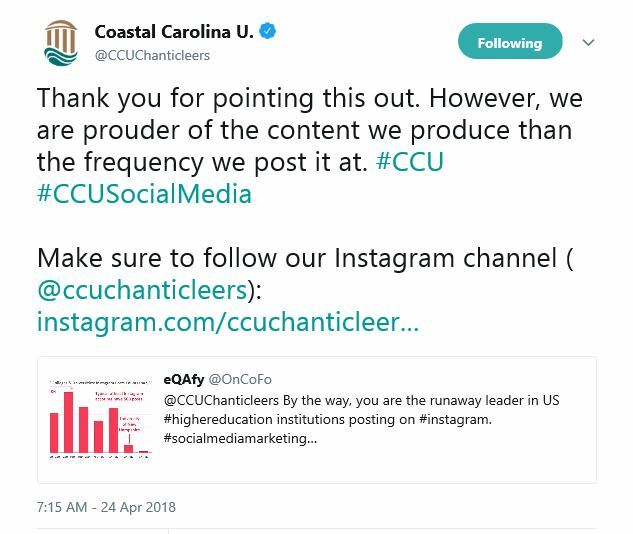 It turned out that our #CCUSocialMedia program leads the entire nation in total Instagram posts. I rather be at the top for engagement or followers (such reports will come out over the next couple months) but I guess this latest report shows that we are definitely active on what I think is the most relevant social media channel in higher education. When notified of our “accomplishment,” our Twitter account responded in this way. Subway Wraps – Did you know Subway now offers wraps?! As the restaurant chain continues to struggle, the company is doing all it can to offer enticing promotions. Any Subway sandwich on the menu can be turned into a wrap and you can choose between tomato basil or spinach flatbread. This past Saturday, our family walked to a nearby Subway for dinner and my wife decided to try one. Sidney opted to “wrapicize” an Italian BMT and she really enjoyed it. I went with a standard sub but perhaps next time, especially if I go for lunch, I will go with a wrap. Dang, I love Subway! After ordering our food at Subway, we walked back to our house to eat. 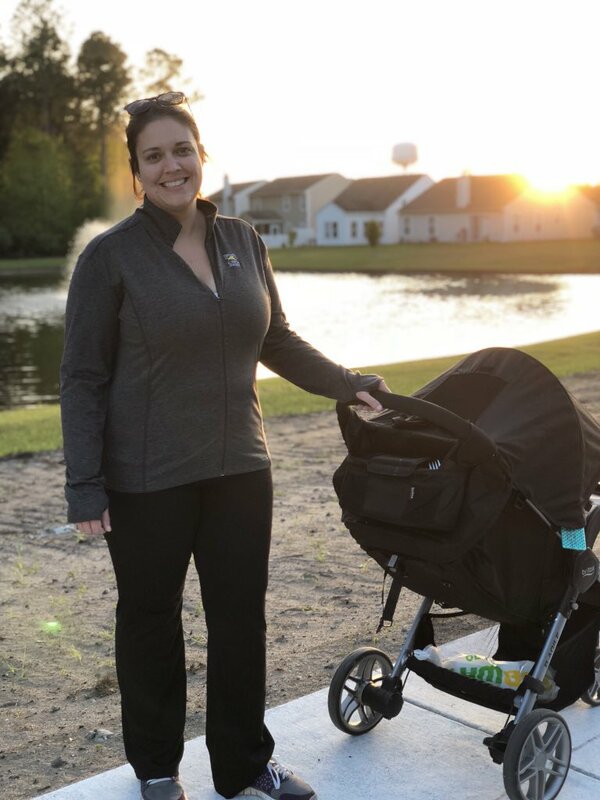 If you look in the stroller, you can see the evidence. Quick Sports Take – Lebron James’ game winning shot last night was nice, but I sure hope the Pacers win the next two games and eliminate the Cavs in the first round. As for the bigger picture, I wouldn’t mind seeing the Golden State Warriors and Boston Celtics in the Finals. The NFL Draft is tonight and while I enjoy Mel Kiper, my interest level isn’t there to watch past the first few picks. In the MLB world the Seattle Mariners are 13-10 which makes me happy, even if I haven’t watched a game yet this season. 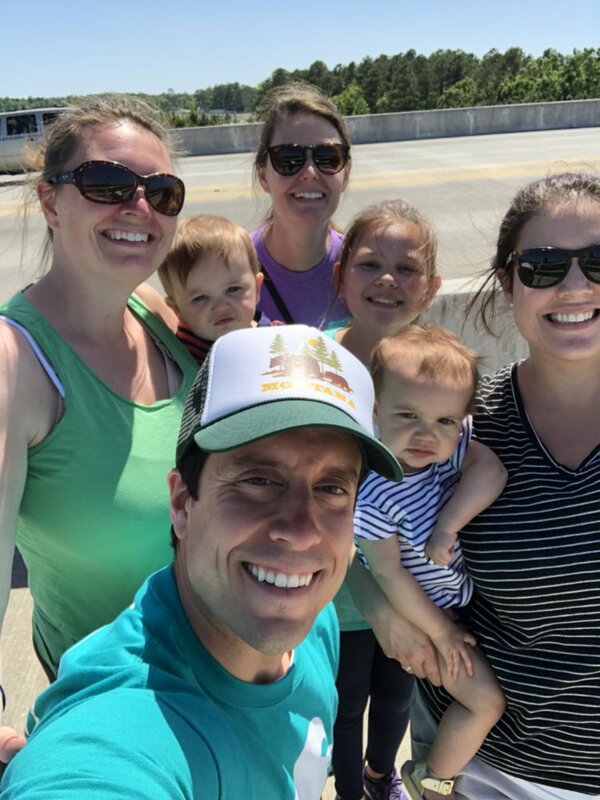 Seems like seasonal weather has finally arrived for most people in the country, including my family out in Washington. Hope everyone has a great weekend! Don’t Blink. From time to time in Don’t Blink, I will refer to Sloan as “brave” or “strong.” Although I do my fair share of proud dad gloating, those characteristics I just mentioned are rooted in indisputable fact. Last night, my wife gave public legitimacy to the courage of our daughter. Last night, Sid wrote this Facebook post. In my wife’s social media post, she eloquently described the feelings of helplessness and despair that consume a parent when caring for a critically sick child. She expressed it better than I could, making it silly for me to even attempt to do the same in this blog. However, based on the discussion I had with Sid after she published her Facebook post, I feel like I can offer a brief epilogue to her beautiful words. Sidney and I kept quiet during and after Sloan’s Pyloric Stenosis battle. We didn’t want to scare relatives and friends. We didn’t want to solicit a storm of social media sympathy. We didn’t want to relive and answer questions about a traumatic experience. During Sloan’s bout with Pyloric Stenosis and for over a year afterwards, we kept it between immediate family. Sidney and I are so thankful for the support of our parents. 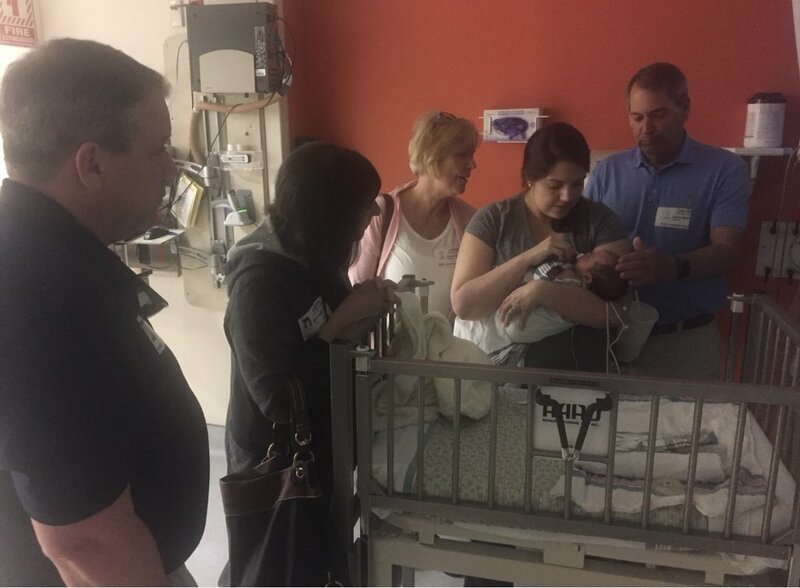 This photo shows our moms and dads with Sloan at MUSC. They say time heals everything. Although I might not go as far as to say everything, I do agree that it heals most. A year after Sloan’s surgery, we have come to grips with what happened. At this point, we are more amazed at the talent of the surgeons who made her better than distraught over the unlucky condition she was dealt. Sidney felt it was time to say something. After I read what she wrote, she asked me what I thought about it. I told her she did a great job. 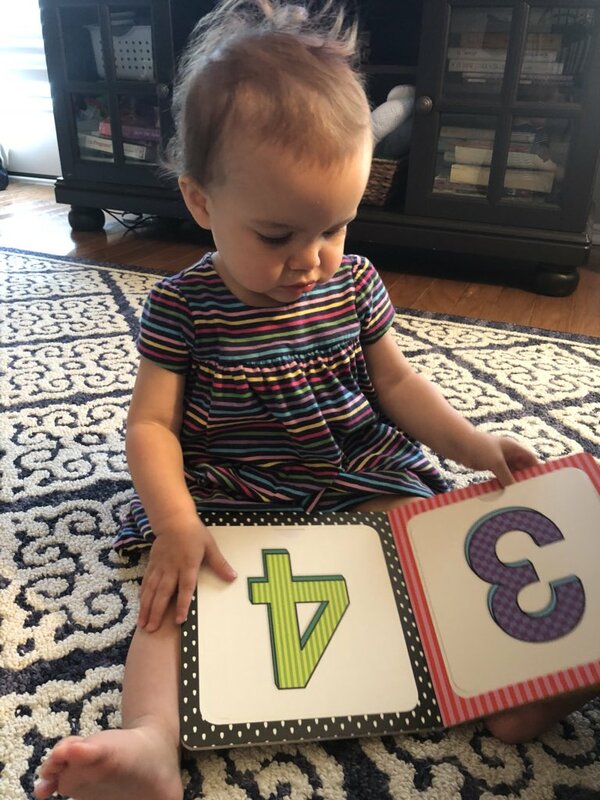 She explained that her main purpose in letting others know about Sloan’s sickness was to shed light on Pyloric Stenosis and reach out to parents who might have a child with the same condition. Sid and Sloan resting the night before we left for MUSC Charleston. 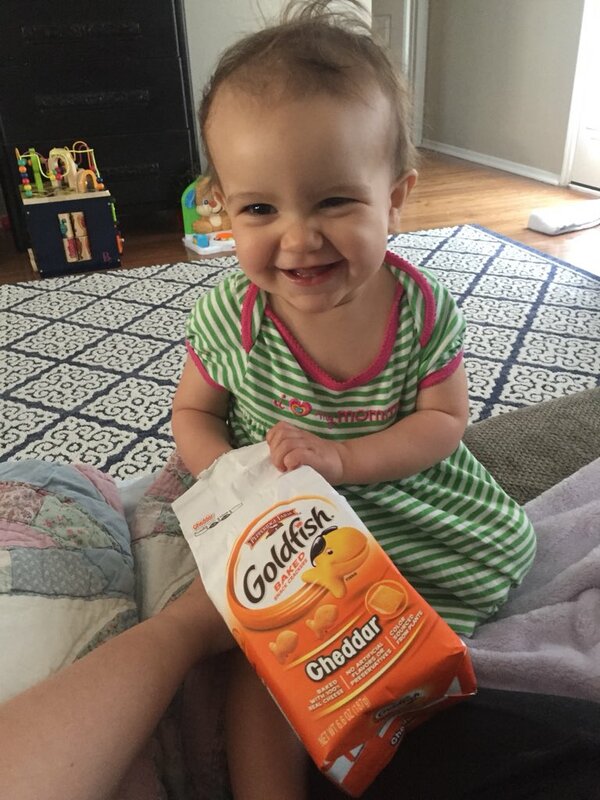 Pyloric Stenosis is a rare condition in infants that blocks food from entering the small intestine. In fact, the condition is so rare that under 200,000 infants are diagnosed with it each year. Food can’t enter the small intestine because muscles thicken and become abnormally large. Because food is denied entrance to the small intestine, the body does the only thing it can…it sends the food back up. Sloan would vomit violently, discharging the formula (or any other liquid) we had given her shortly before. It doesn’t take a doctor to conclude that it is a bad sign when the body can’t digest food. Luckily, the condition is treatable. Skilled doctors can cut away at the thickened muscles and create a pathway for the food to enter. 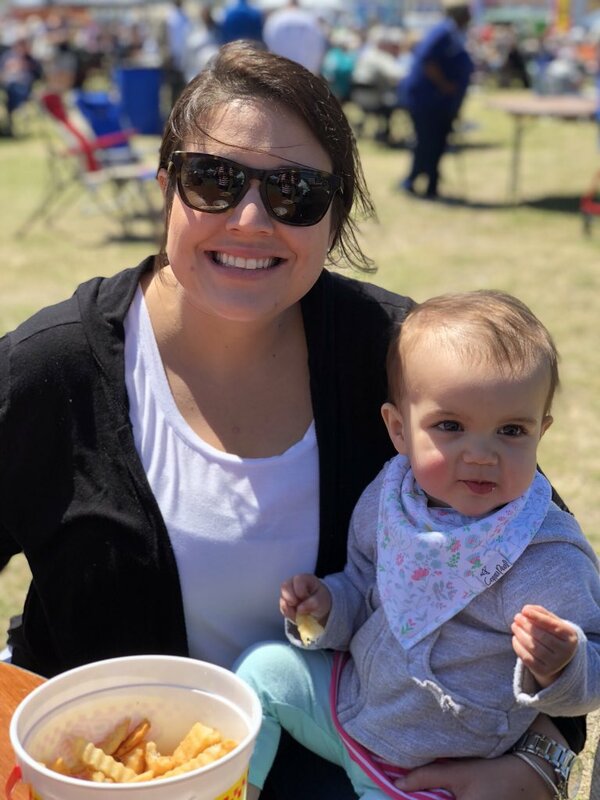 In Sloan’s case, she was initially misdiagnosed, with doctors originally telling us she didn’t have Pyloric Stenosis. 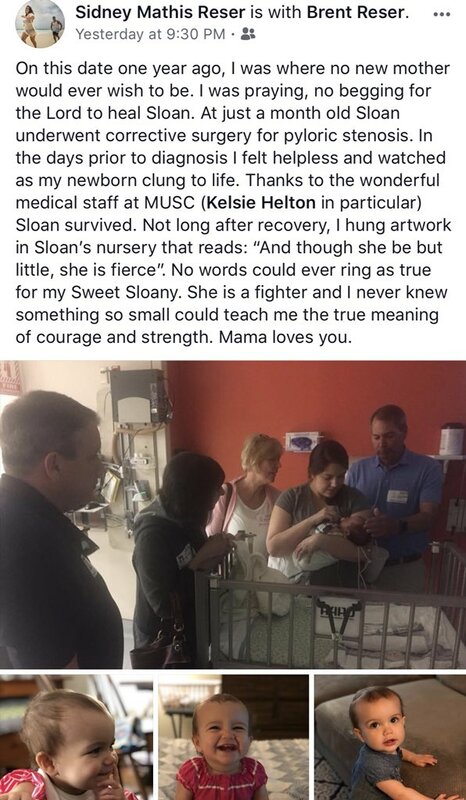 This of course added misery to our experience (especially Sloan’s) but once medical professionals were able to see the blockage, we took Sloan to MUSC in Charleston for surgery. More on this in just a minute. 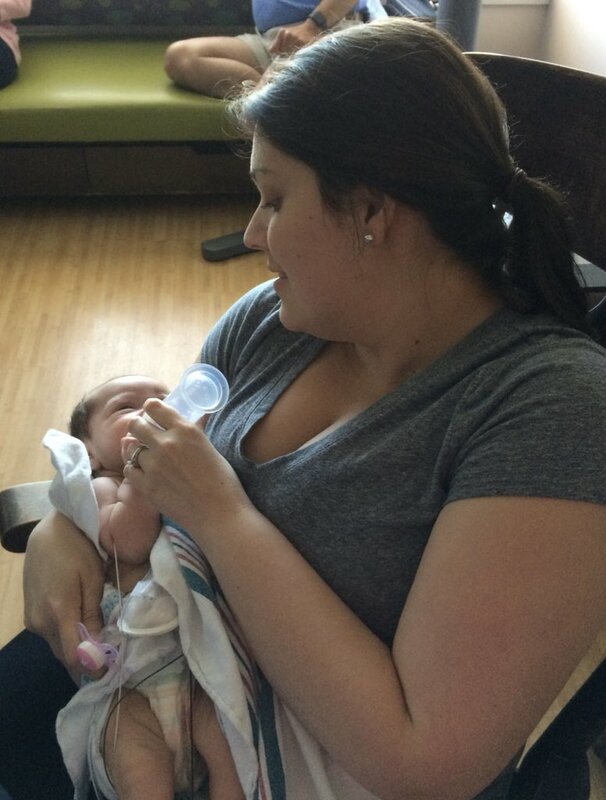 Sid feeding Sloan her first bottle after surgery. What Sid and I want to do is to let parents who have a child with Pyloric Stenosis know that things will be okay. Once your baby undergoes surgery, which we understand is very scary in and of itself, he/she will go from throwing up at all hours of the day/night to returning to a happy baby who digests food normally. Watching your baby constantly throw up is awful. Seeing your baby dehydrated and hungry is painful. 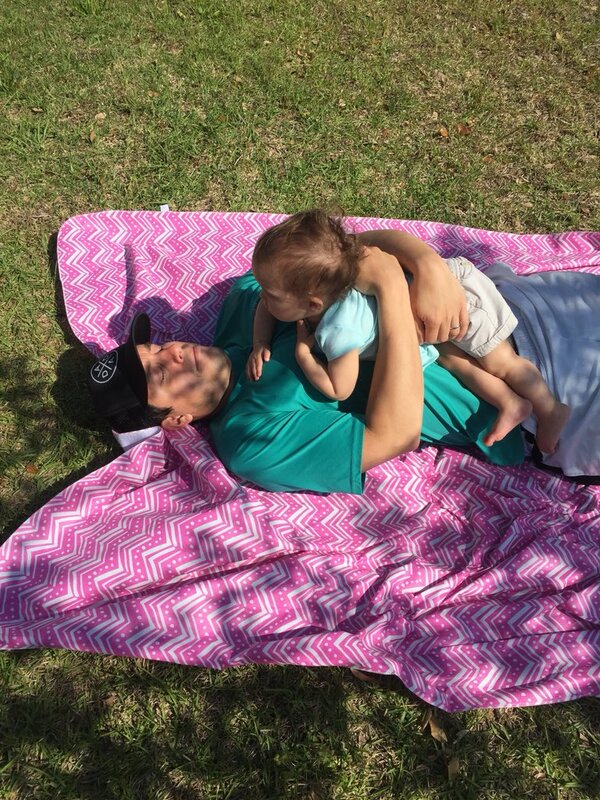 Observing your baby hooked up to an I.V. is disheartening. Sending your baby off to surgery is downright frightening. But there is light at the end of the tunnel. 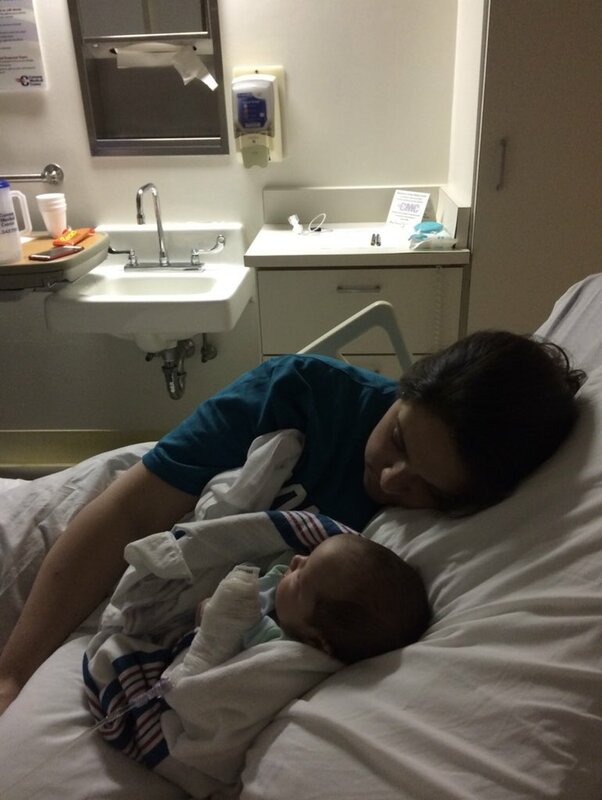 When we were going through this, our little family was blessed to have a couple who went through what we did. The husband offered me assurance and the wife offered Sidney assurance. Before Sidney rode in the ambulance with Sloan to Charleston, the wife gave Sid a pep talk, letting her know that relief would soon be in hand. It was comforting and it meant the world. 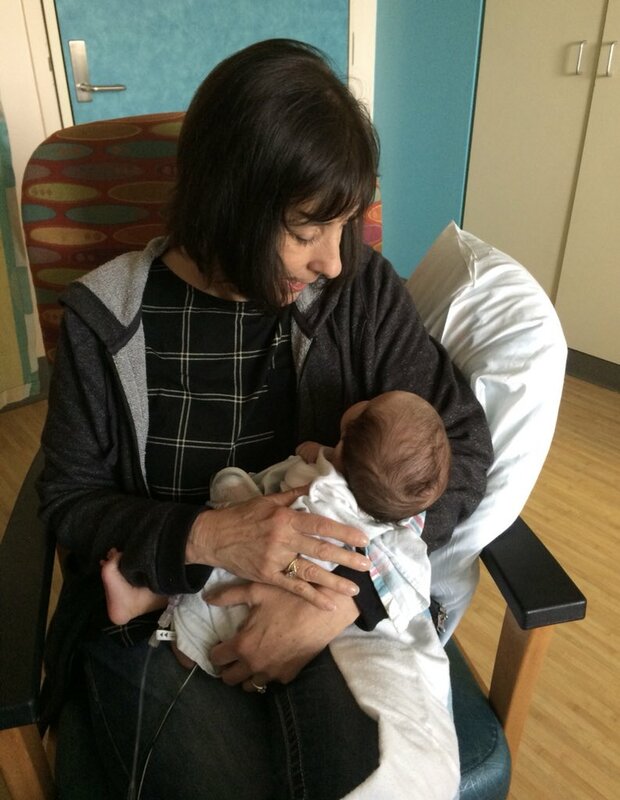 My mom holding Sloan in the MUSC hospital room. It is our turn to take the role of the special couple that helped us. To anyone who reads this post today or years down the road who has a baby with Pyloric Stenosis or knows someone with a baby who has the condition: Please reach out. It doesn’t matter if you read my blog regularly or if you stumbled upon this post via a Google search…we would love to help you and pray for you. 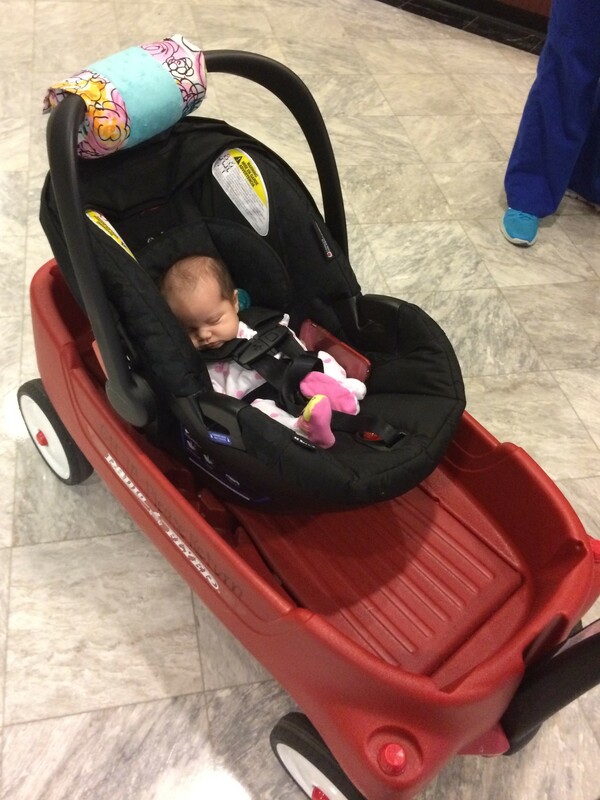 This is Sloan being wheeled out of MUSC on a wagon after receiving a clean bill of health. 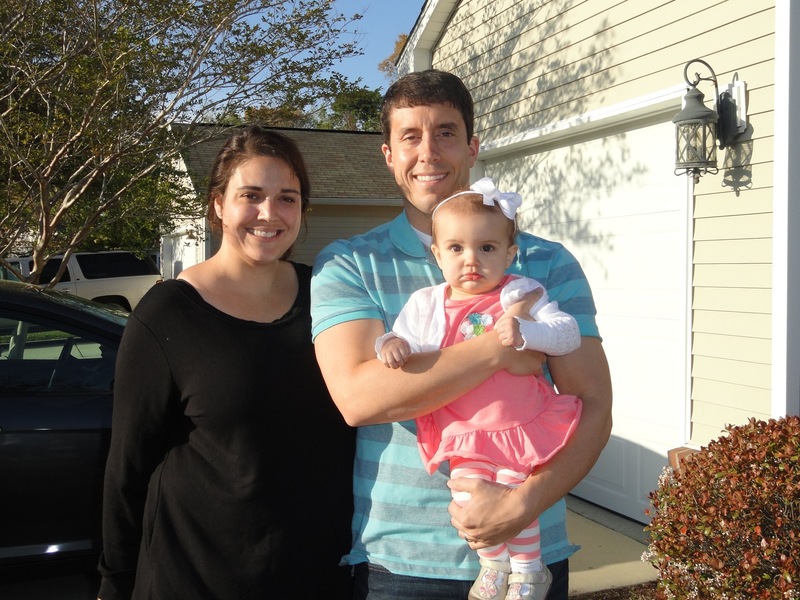 The person who has forever entered our prayer life on a nightly basis is Dr. Robert Cina of MUSC. We thank God constantly for his talent and skilled hands. He is the head surgeon who performed the successful surgery on Sloan, healing her completely. We are also eternally grateful to the entire MUSC pediatric staff for their care and compassion. Of course we will never be able to thank our parents enough for being with us every step of the way. 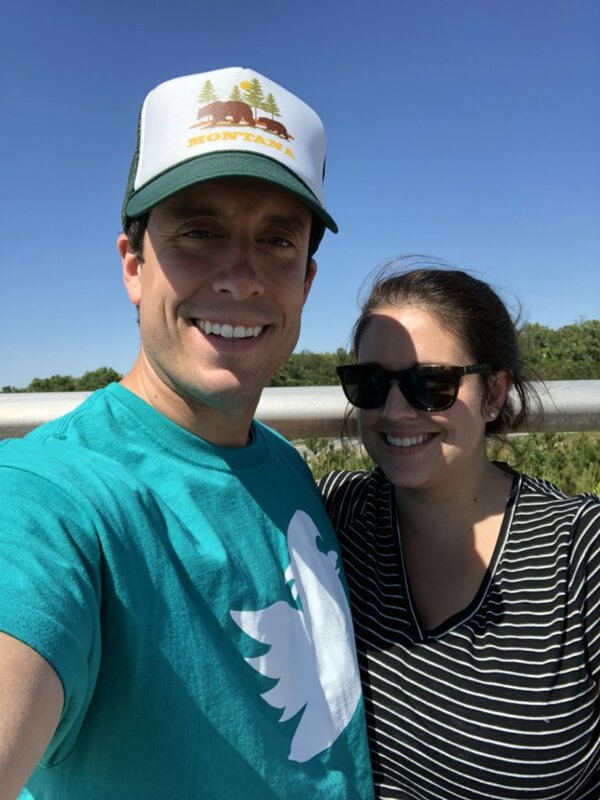 Although the worst of Sloan’s Pyloric Stenosis episode only lasted for about a week, we certainly needed our support system. Sloan is a healthy little girl who brings us so much joy. Sidney planted the seed last night for us to give back. Hopefully, we will have many opportunities to do so. Don’t Blink. I have made it well-known that my parents did not believe in buying us gaming systems growing up. If we wanted to play Nintendo or Sega, we had to convince one of our friends to let us play it at their house. However, there was one “exception”. Although I don’t know if you can call it a gaming system per se, the three of us Reser children did have Game Boys growing up. One Christmas, Santa surprised my sister and I with the handheld gaming consoles at our grandparents’ house. A few years later my brother would get one as well. Whatever amount my parents paid for the Game Boys, I am sure every cent they spent was returned to them tenfold within the first year we had them based solely on how they got us to shut up on car trips. 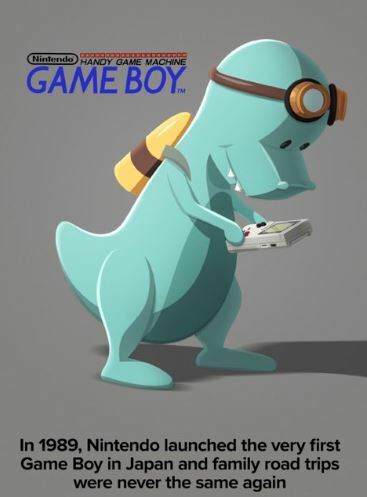 This past Saturday marked the 29th anniversary of the Game Boy release. It made me reflect a bit on the hours I spent with my own through the years. I learned about Game Boy’s 29th anniversary via Timehop. It is funny, but the Game Boy game I hated the most ended up becoming the one I liked the best. Santa gave me my Game Boy when I was probably 7 or 8. At the time, the only game that came with it was Tetris. I remember spending that Christmas trying to figure out how to play it. My young brain couldn’t grasp the concept of positioning the shapes to make lines so I resorted to stacking the blocks as quickly as possible, recording successive Game Overs in record time. It was a steep learning curve, one I had little patience for at the time. However, as time went on I understood and embraced the intellectual challenge of Tetris. As I entered my late teens, I resurrected my aging Game Boy and played many riveting games of Tetris. My friend and I performed road construction over the course of a couple summers after high school. The work would take us on long road trips to work sites. We would pass the time by taking turns on the Game Boy, seeing who could record more lines than the other. When we turned the Game Boy off and actually started doing the road construction work, our brains would still be in “Tetris Mode,” organizing blocks in our heads as we removed road stripes from the pavement. 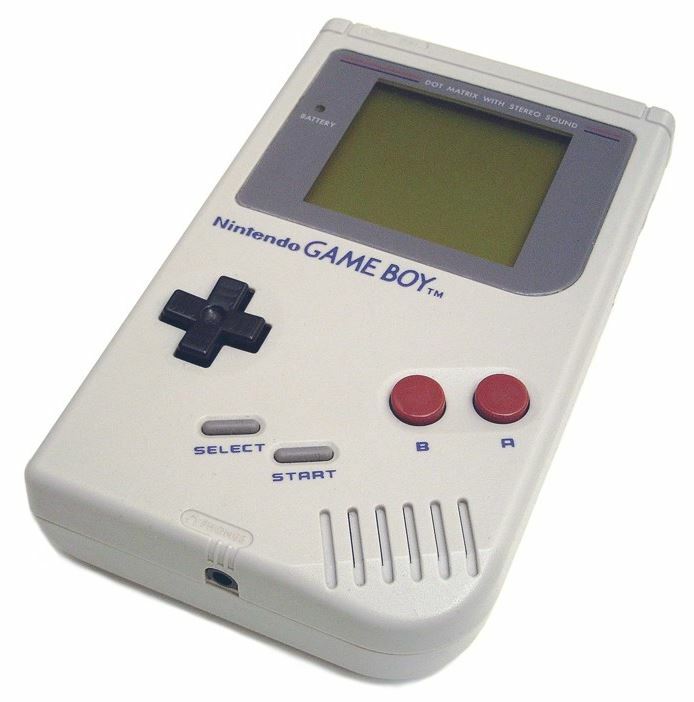 The Game Boy is a classic toy that occupied many hours of my time as a child (and as a young adult). Between my Tetris frustration and my Tetris Nirvana, I played a lot of Super Mario. It was a great game, one I took pleasure in beating after much practice. Donkey Kong was another Game Boy classic that I pursued endlessly. Much to the chagrin of my parents, I tried to sneak games of Mortal Combat in every now and then. Of course I devoted a lot of hours to the sports games as well, playing ones such as Big Hurt Baseball, NBA Jam, Madden, and NCAA Basketball. This is my brother’s Game Boy but my Donkey Kong and Madden 1995 games (thanks for taking the photo, mom). 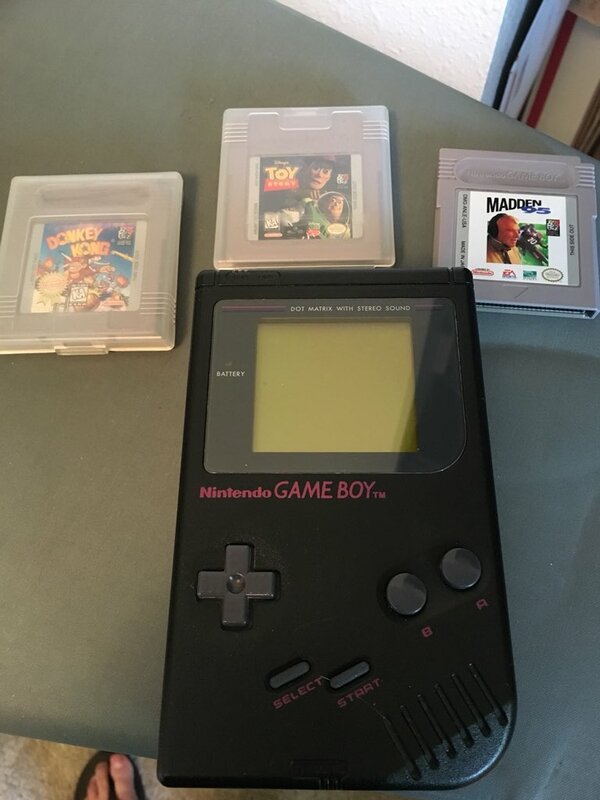 I fondly remember the red battery light of the Game Boy, the up-to-down scrolling Nintendo logo that would appear before you started any game, the black Game Boy case I had, and the simple control layout of the console. Ahhhhh, good times. Even though I haven’t played Game Boy in probably 10 years, I could still pick one up and play it as if I was riding a bike. Perhaps for next year’s 30th anniversary I will try to get my hands on one and play for old time’s sake. Don’t Blink. Over the past few years, I feel as if the food truck concept has been romanticized. Social media, movies, and news organizations hail them as quirky mini restaurants on wheels with delicious and creative food. Brightly colored food trucks with social media handles plastered on them have become commonplace on our nation’s streets. With the success of food trucks, it didn’t take long for event organizers to ask a question: What is better than a food truck? Easy! How about a couple dozen food trucks?! Thus, the birth of food truck festivals. The second annual Myrtle Beach Food Truck Festival was held this past weekend. The backdrop for the fest was the ocean (this is not my photo). 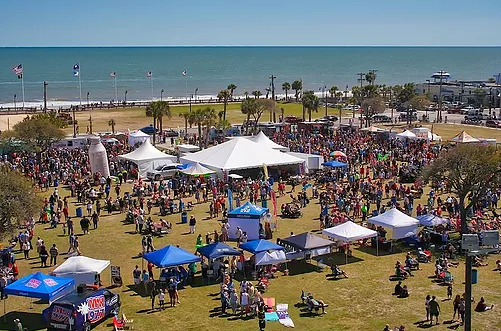 This past weekend, the second annual Myrtle Beach Food Truck Festival took place. As someone who has found himself swept up in the hype of food trucks I described above, it didn’t take much convincing when Sidney asked me if I wanted to go. So, on Saturday, our little family, plus my in-laws, ventured to downtown Myrtle Beach. 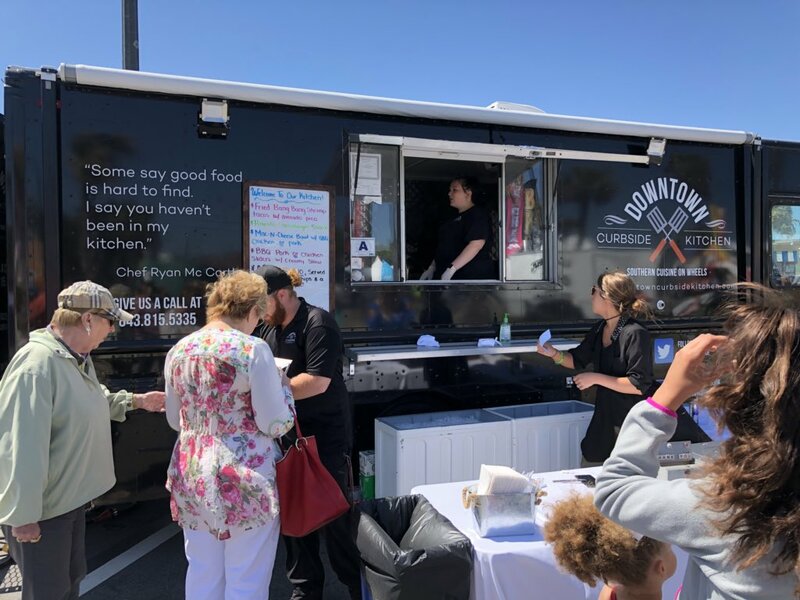 Hearing about large crowds and a food shortage that plagued last year’s event, we made sure to show up right when the festival opened at 11 a.m.
Sid and Sloan at the second annual Myrtle Beach Food Truck Festival. Because we showed up right when it started, we had an unobstructed path to browse the 30 (yes, THIRTY) food trucks that had parked on the site of the old pavilion, right next to the boardwalk. 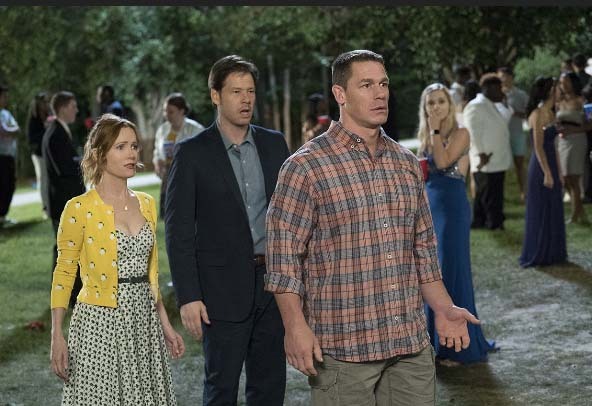 The selection covered all genres from sandwiches to burgers to burritos to pastas to fried foods to noodles to desserts to anything else you could imagine. Alcoholic beverages were available, a band was playing, and kid activities were offered. It was a neat setup. I enjoyed BBQ chicken macaroni and cheese from the Downtown Curbside Kithcen. This is the food truck I got my mac and cheese from, Downtown Curbside Kitchen. As I put together a plan for my food festival experience, I envisioned splurging and purchasing at least two different entrees. However, the mac and cheese dish I got came with homemade chips and a mini Moon Pie, draining my enthusiasm (and stomach space) to buy something else. I still ate half of Sidney’s pizza and a good portion of Sloan’s fries though. 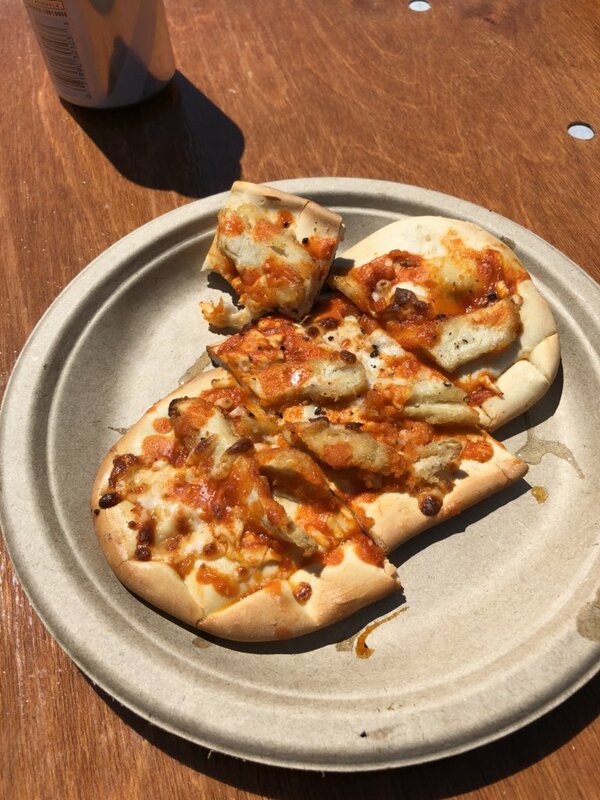 Sidney’s buffalo chicken pizza from Charleston Flats. Our desserts, fried batter at its finest, also made me think twice about visiting a second food truck. It was for the best. I got to sit comfortably with my girls and in-laws as we chowed down and sipped adult beverages while enjoying the band. 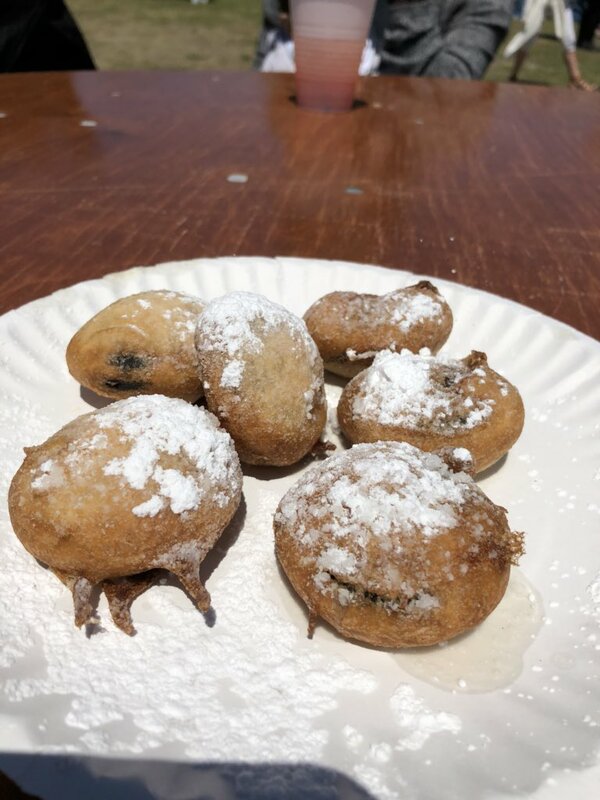 These deep fried Oreos were on point. For the most part, the food was good. Not exceptional cuisine by any means, but it did hit the spot. As I alluded to above, pop culture attributes food trucks to offering mouth-watering and unique food. I would say that once you take off the rose-colored glasses, the “unique” part of the description is usually more true than the “mouth-watering” part. This is the E.Z. 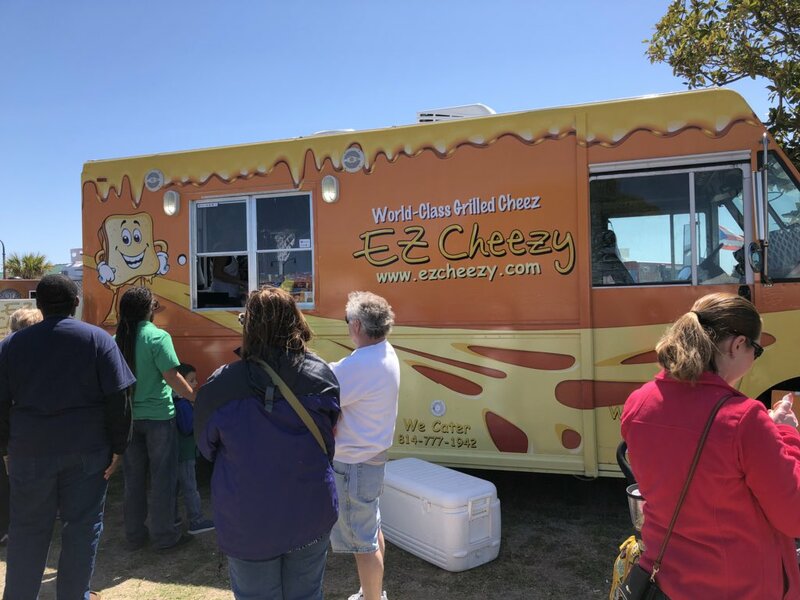 Cheezey Grilled Cheese food truck that Brenda got her sandwich from. 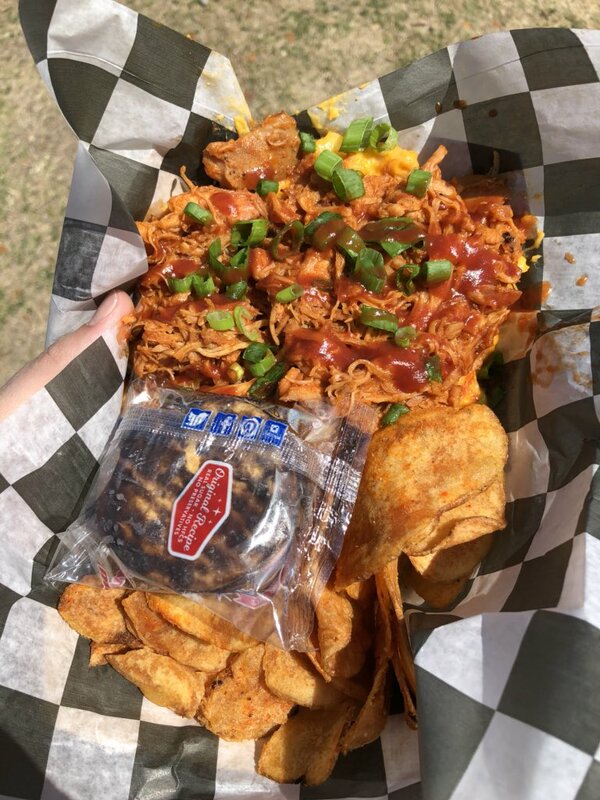 We had a good time at the Myrtle Beach Food Truck Festival and would go back again. I think arriving early was a key to our enjoyment and I can imagine we will be early birds again in 2019. Don’t Blink. Latin Food in Myrtle Beach – Last Saturday, Sid and I had the chance to slip out of the house for an hour to go to dinner while my in-laws looked after Sloan. 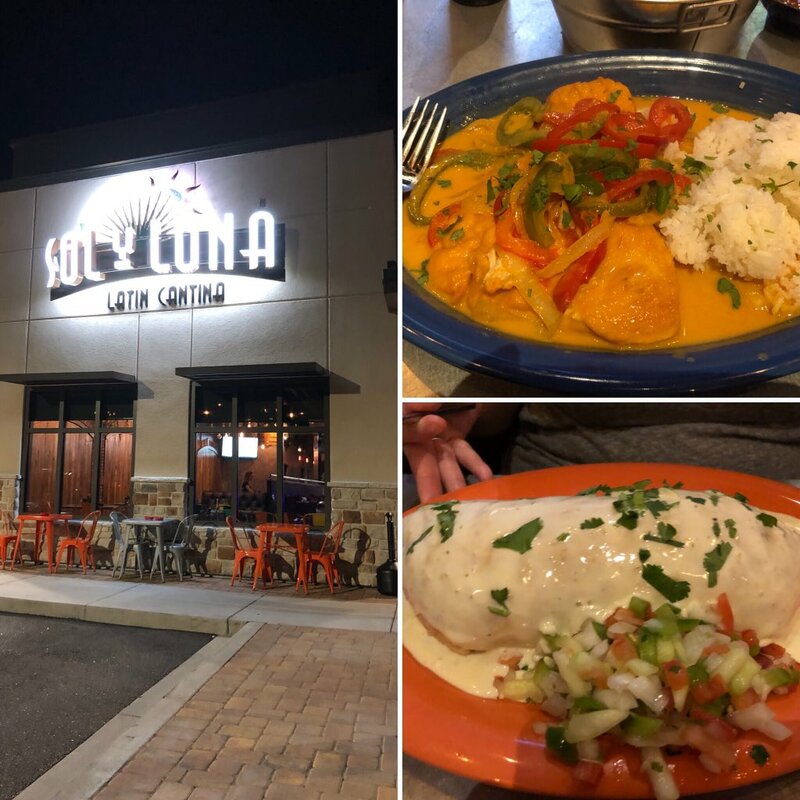 We went to a brand new place right next to our house called Sol Y Luna. 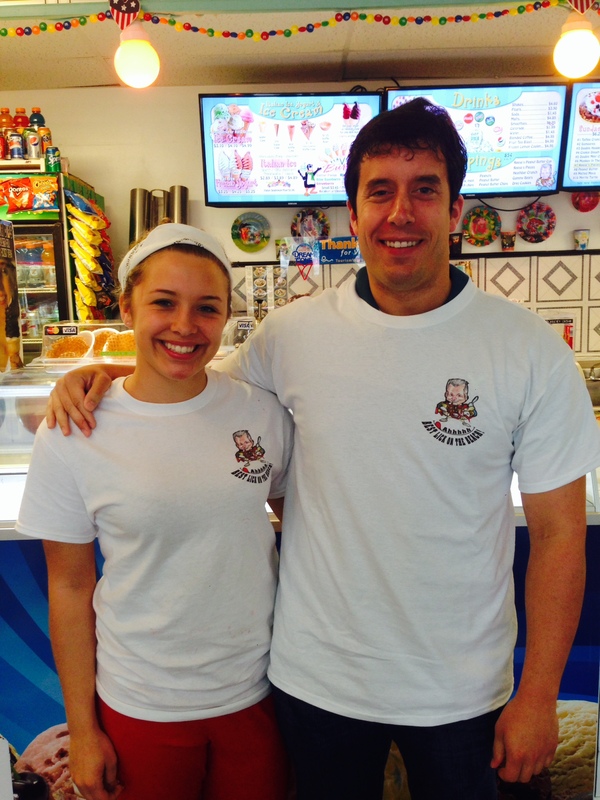 Specializing in Latin food, the cuisine is well-represented by the atmosphere. Right when you walk in the small eatery you can immediately sense a vibe, exactly what you would expect from a cantina. Sidney ordered a burrito but I was a bit more adventurous. I went with the pollo en coco, which translates to coconut chicken. Although it was nice to try something that you normally can’t get in Myrtle Beach, Sid and I weren’t blown away by the food. But we still had a fun time enjoying our dining experience together. I look at the exterior of Sol Y Luna along with our entrees. Another Photo of Sid and Sloan – This is a Don’t Blink exclusive. 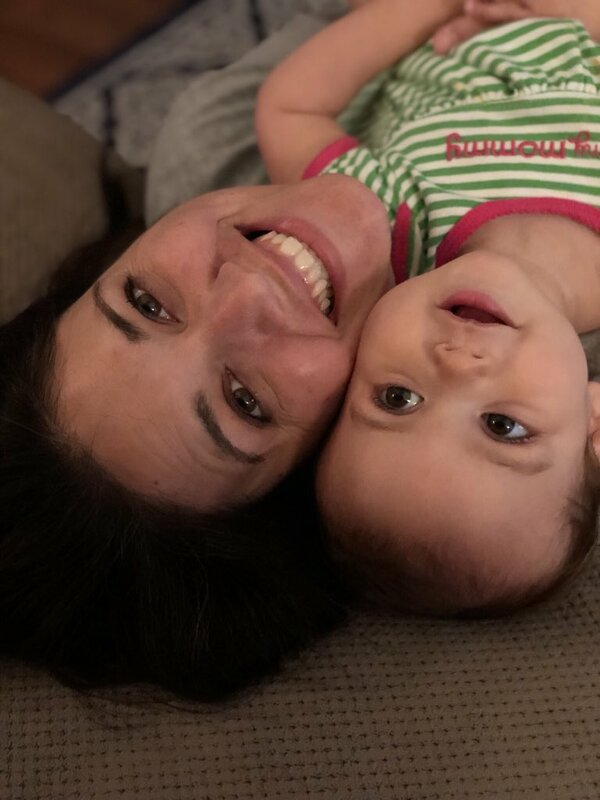 I took this upside down photo of mommy and daughter last night. Sid was making Sloan laugh hysterically as they rolled around playing on the floor. Sidney calls Sloan her best friend and whenever I watch them together it is easy to see why. Sid and Sloan playing hard. 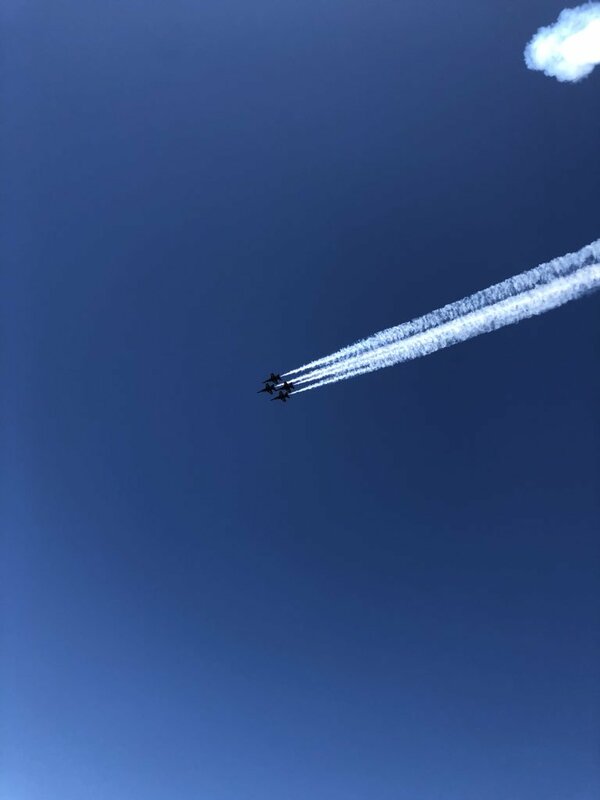 Southwest Airlines Death – I wanted to offer my sympathies to the woman who lost her life on the Southwest plane that had its engine explode. 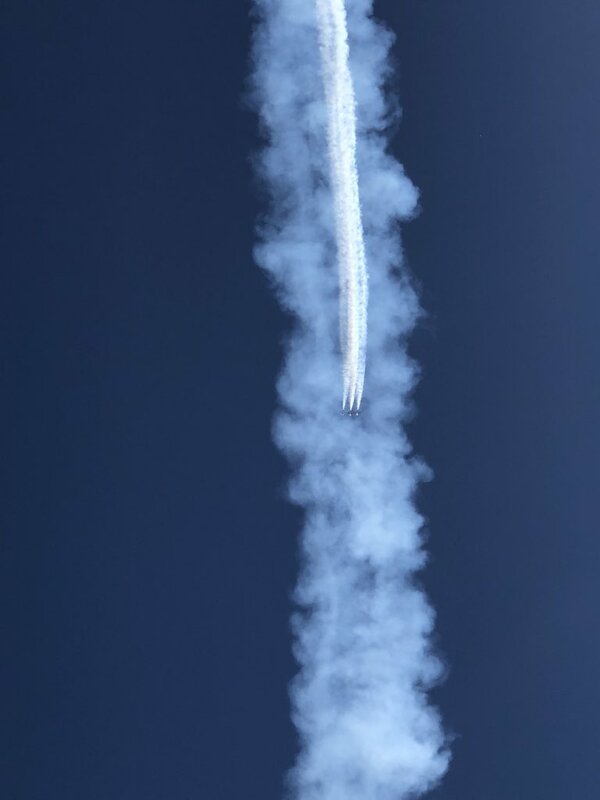 Can you imagine sleeping on an aircraft only to wake up and find yourself half way out the window? The horrific bad luck that targeted Jennifer Riordan makes me very sad. 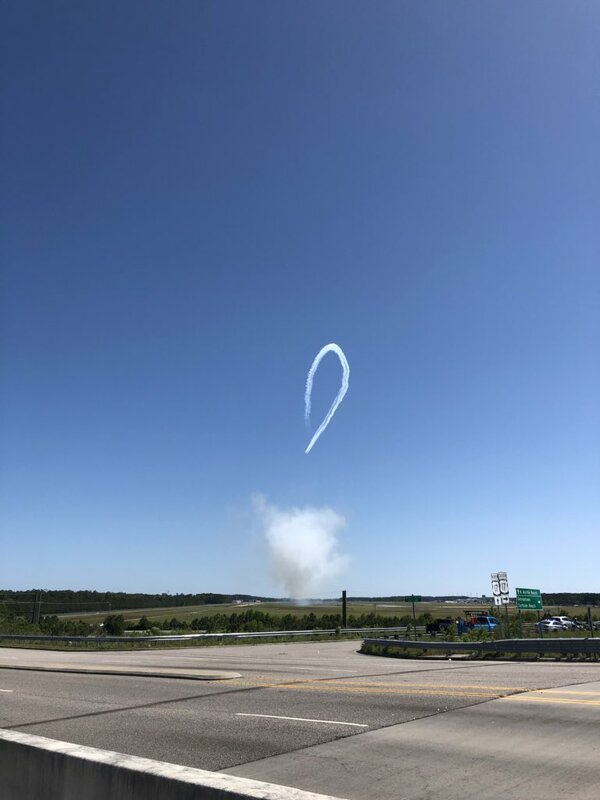 I am inspired by the pilot who performed a successful emergency landing but I can’t stop thinking about Riordan and her family. 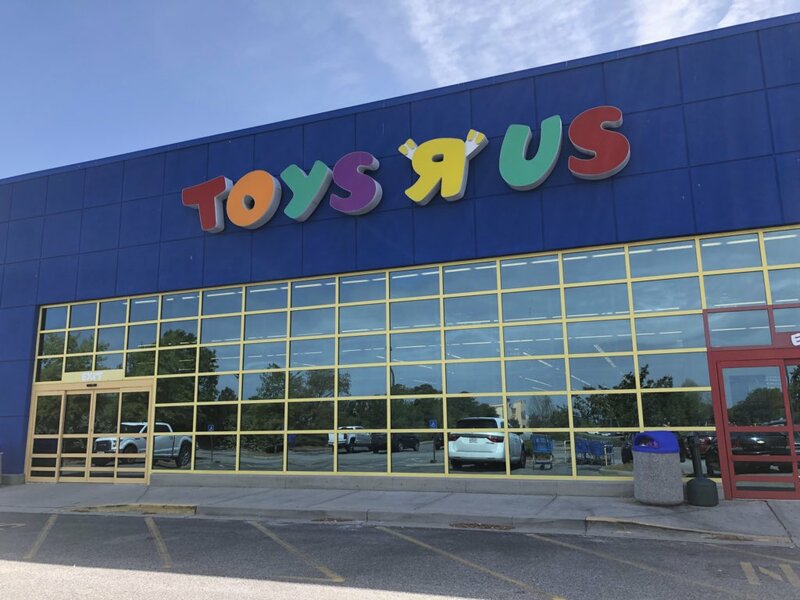 Toys R Us Disappointment – Aside from a last ditch effort from a bidder to buy the floundering toy chain, Toys R Us will soon be a thing of the past. Stores across the country are holding going out of business sales. 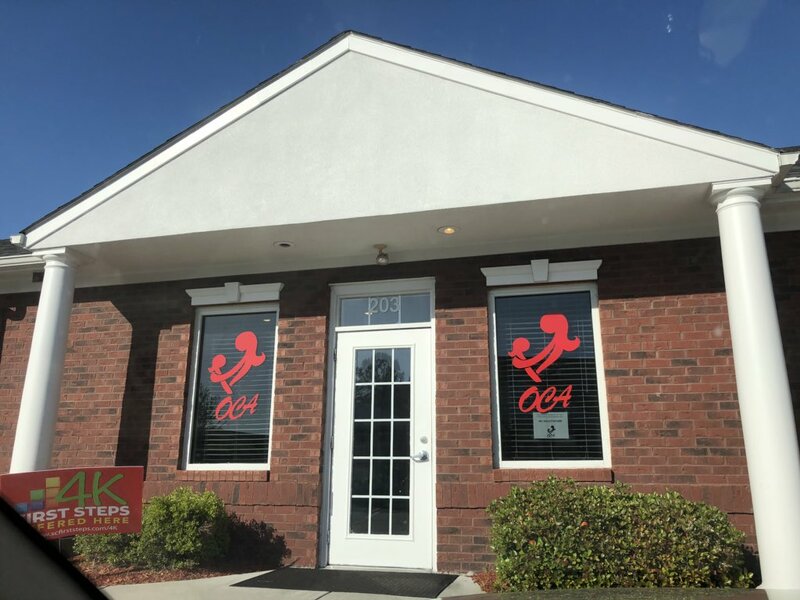 Over the weekend, the three of us went to our local Myrtle Beach location to grab some deals. What we walked into was an underwhelming marketing ploy. The closing signs were plastered everywhere but the prices to reflect it were nowhere to be found. If the merchandise was in fact on sale, most of it was 10% off. Some select inventory was marked off at 30%, the biggest discount that was offered. My issue with this is that my wife went to Toys R Us well over a month ago and the discounts were the exact same. At the pace the sale is going, they probably won’t get to 50% until after Christmas. A photo I took of the Myrtle Beach Toys R Us. Funny Advertisement – Earlier this work week, I found myself behind this car. 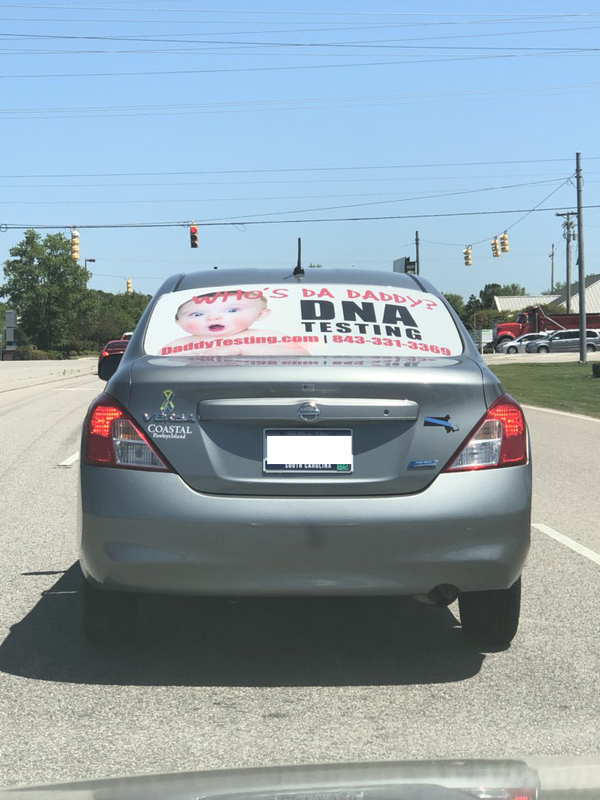 I think the person inside is the guy Maury Povich calls up to administer the paternity tests on his talk show. All jokes aside, the advertisement did its job by capturing my eye and drawing a laugh. I got a laugh out of this advertisement. 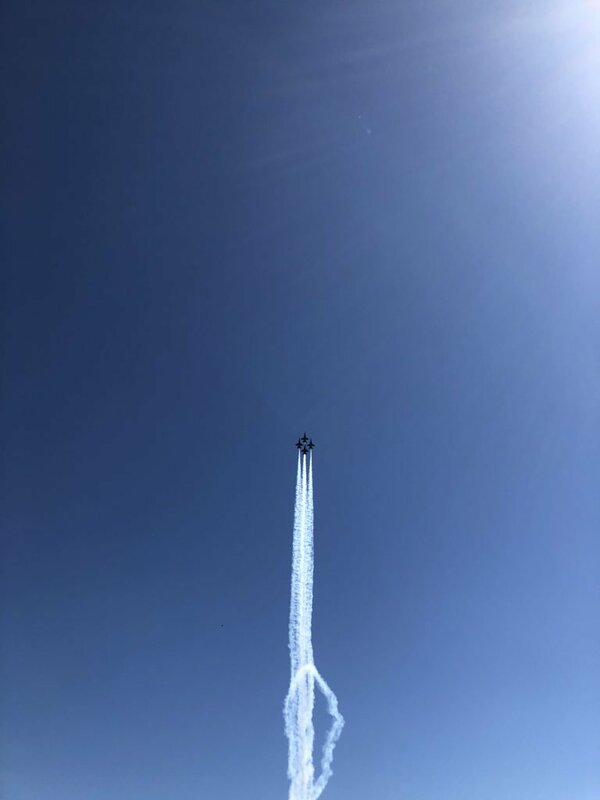 Hope everyone gets some nice weather this weekend. I appreciate your support of my blog and I look forward to touching base next week. Don’t Blink. Looking at my Timehop app on my phone always seems to spark ideas. When glancing at it today, two separate events inspired me to think of a product that would likely do extremely well. Let me explain. Five years ago, I wrote about kettle corn. Why? Well, because my name is Brent Reser and I write a blog that deals with random, miniscule topics that no one cares about. To be honest, I was inspired to address kettle corn because I had ate it the night before I wrote the post and I found myself flooded with nostalgia. As a kid, I always knew I was at a legit event or festival if the sweet aroma of kettle corn was in the air. 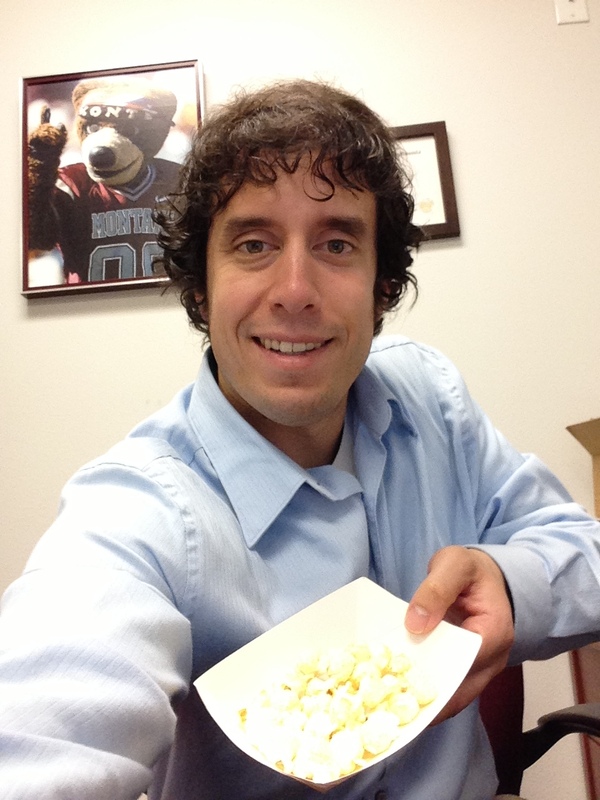 This was me five years ago enjoying some kettle corn in my office. On this day three years ago, I achieved one of the greatest accomplishments of my life when I successfully completed the Waterdog Challenge at a local Myrtle Beach ice cream shop. I managed to stuff down an ice cream platter that consisted of SEVEN scoops of ice cream and FIVE toppings. I faced adversity and doubted myself at times but when the clock expired I had consumed the entire ice cream mountain, including the waffle plate it was served on. I received a t-shirt (I am pictured with the store employee who conducted my challenge) for completing it. So, as I reflected on my kettle corn obsession and my ice cream eating gluttony binge, a pretty spectacular idea occurred to me. (my brain) Kettle corn, ice cream. Ice cream, kettle corn. Kettle corn, ice cream. Ice cream, kettle corn. Kettle corn, ice cream. Ice cream, kettle corn. Kettle corn, ice cream. Ice cream, kettle corn. OH MY GOSH…how about kettle corn ice cream? I am going to go out on a limb but I think a kettle corn flavored ice cream would be a huge hit. I am thinking big enough and original enough that Baskin-Robbins might be calling to buy rights to it. Perhaps nothing carries with it a more signature taste than kettle corn. Of course there are many products that capitalize on a sweet and salty taste but kettle corn’s flavor seems to pack with it a hint of something extra. As I mentioned above, kettle corn is synonymous with special occasions and big events. When you eat it, not only are your taste buds treated to a flavorful sugary adventure, but your mind conjures up pleasant memories. Folks would be willing to try kettle corn ice cream in a heartbeat. It wouldn’t be one of those deals where someone would say, “Well, I like kettle corn and I like ice cream but I don’t think I would like kettle corn ice cream.” (Which reminds me, I don’t think I have ever written about the grape Kool-Aid Pop Rocks blizzard I had at Dairy Queen several years ago…it was bad). To me, kettle corn ice cream seems like a natural combination. Am I on to something or is it just another one of my failed harebrained ideas? I honestly think it would do well, once the obvious question is answered: What would be the perfect topping for kettle corn ice cream? Don’t Blink. 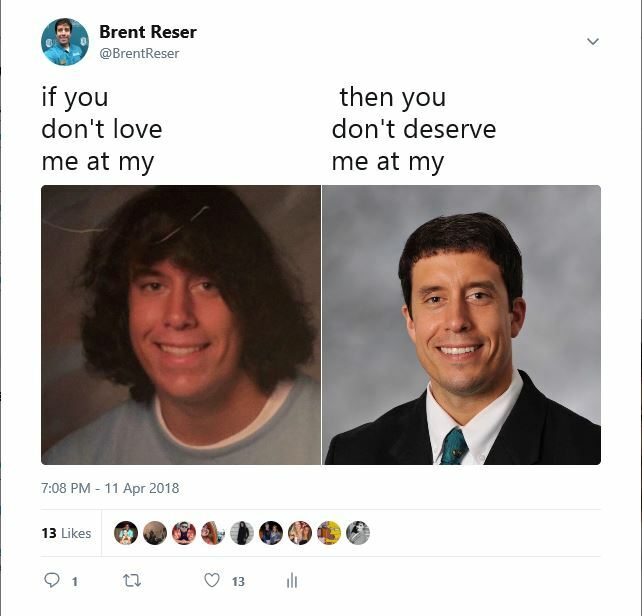 Hello, my name is Brent Reser and I have not uttered the words, “No problem!” for three years. This past weekend, I ripped past my Friday the 13th Life’s Little Instruction page to see the latest one pictured below. It immediately made me smile and think about the customer service training I have received since arriving at CCU almost four years ago. 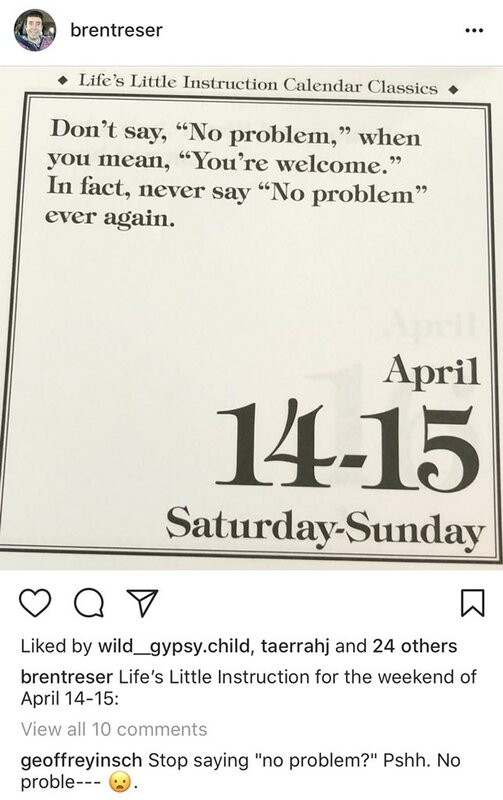 This was my Instagram post from my Life’s Little Instructions calendar this past Saturday. Some people might be shocked to hear this (I know I was at first), but cheerfully telling someone “no problem” is frowned upon in the customer service world. 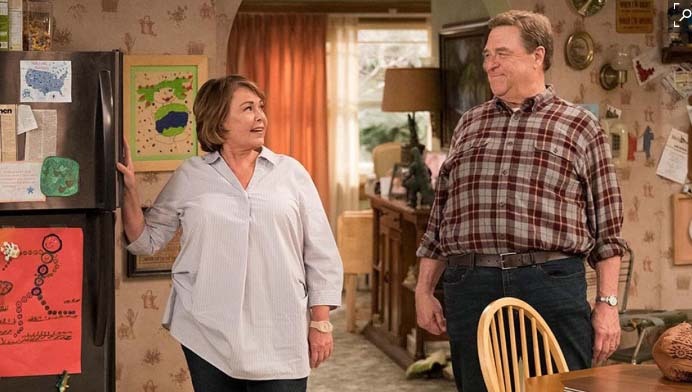 Luckily, thanks to the Feel the Teal program at Coastal Carolina University, I have refrained from saying this troublesome phrase for the past few trips around the sun. “No problem” didn’t evaporate from my lexicon immediately, but the more I tried my best not to use it and the more I realized how bad the phrase actually is, it eventually stopped slipping off my tongue. When someone says “no problem,” it insinuates that there is/was a problem. When someone expresses their gratitude to you, it doesn’t make sense to respond by saying something that doesn’t convey any sort of warmth or sentiment. At best, “no problem” means nothing. How is it acknowledging what someone said to you? This of course brings us to the preferred response when someone offers thanks. At CCU and thousands of other places where customer service is valued, the response “my pleasure” is encouraged. Although some people might immediately think of chicken sandwiches when you say it, the phrase is starting to lose its Chick-fil-A association and be recognized simply as the polite and proper way to acknowledge someone’s gratitude. My Life’s Little Instruction post generated a lot of interaction. Some people endorsed the advice right away while some wondered about alternatives (remember, always use my pleasure!). Please note, I never judge anyone who utters “no problem”. I understand that it is a common phrase in our culture and that not everyone associates a negative connotation with it. To some, “my pleasure” sounds too over the top. I get it. But for those of us working in the customer service world, I think it is important to respond in a thoughtful way. Perhaps as a society we aren’t at the point where we automatically respond with “my pleasure” when we buy a friend a drink or lend someone a couple quarters for the vending machine. However, in a customer service setting, I think we can always respond in a way that is modern and appropriate. Don’t Blink.